I'm not 100% sure where to start this post. Last week's blog covered up until Sunday so it doesn't leave much room for this week. I added 8 more stamps to my passport and have reached day 200 (as of today) of traveling. I have also chalked up Croatia, Bosnia, and Slovenia as countries visited (and to be visited more in the near future). Besides that, I've been focusing on one thing and one thing only. You see, just before I left for Austria, I had been talking/half-joking with one of the other volunteers about buying some sort of vehicle. You know, to allow me to actually travel a bit without relying on the buses or trains. In the midst of this conversation, I jumped on the Serbian version of Craigslist (called Kupujem Prodajem) and searched for motorcycles. 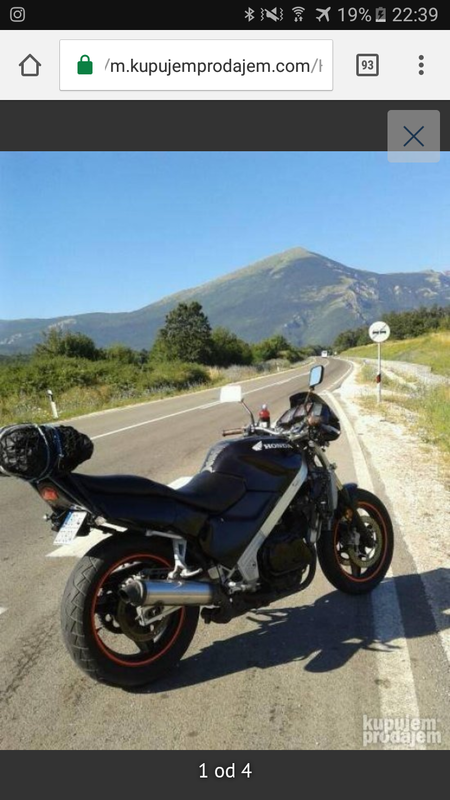 Within mere minutes, I stumbled upon a 1989 Honda VFR750F for 700€ (~$770) and immediately, it had my complete attention. I mustered up what Serbian I know and sent the man a message asking if A) he still had it for sale and B) if he speaks English as I'm just learning Serbian so my vocabulary is fairly limited. He replied later that day saying that he's in the opposite boat, but that I could send messages in English and his wife would help to translate. Again, this was before I left for Austria so there were large gaps in our send/reply times. Sunday rolls around and I've returned to Belgrade - Mario (the motorcycle owner) and I have yet to set up a time where I can view the bike and give it a full look-over. I'm waiting for my cash to transfer to a usable debit card to make the drive out to where he is. (I'll keep waiting even after I have the cash as I still don't have a car myself... hence the motorcycle idea). Monday passes and still no word. In the mean time, I've worked on a bunch of small tasks around the hostel though my mind is still on the motorcycle. Tuesday passes and still no ride so I take Mario up on an offer. He will ride to the hostel where I'm staying and Branko (the owner/friend) will sign the papers to put the bike under his name. Something I am unable to do as a non-resident. If all goes well, we'll finalize everything and he'll bring the bike back the following day with a car driven by his wife so he can get back home. In the end, this is the route that we take, I look over it, and take it for a ride. I'm hooked instantly. It's nearly the same size physically (with a similar but slightly updated version of the engine sitting in my motorcycle at home in the States) and has the same deep rumble that just oozes torque. For 700€! I shake his hand, offer him a portion of the cash as a down payment until he returns the following day (he refuses), and then we meet up on Wednesday. Unfortunately, it's raining so I can't really ride it at all. Oh well, it's mine! It's difficult to put into words just how much I've missed having some sort of vehicle and more importantly, feeling the wind on me and having the unobstructed view that only a motorcycle offers. I'm quite literally infatuated at this point. In the days following, I've still managed to do some menial tasks around the hostel, though I take every chance that I get to go buy parts at the supply store or just go for a ride. I met up with a fellow biker at the local bike shop and he introduced me to a local mechanic who has knowledge rivaling that of my step-father, George. As someone who has dealt with old Japanese motorcycles since I was 12 and later, worked as a mechanic, I'm back in my realm. My old world of grease, chrome, and carburetors. So besides starting to work on a new website for the hostel, I've spent the last 30 hours or so checking out part sites and seeing what replacement parts/mods there are for this bike. Oh, and riding it to go meet up with a friend. Even though I knew there was a chance of rain later that night... Oh well. Anyways, I apologize for all of the motorcycle talk. You see, I LOVE anything mechanical and I especially love the old 80's and early 90's Honda VF/VFR's. There's just something about them that I can't get enough of... Rather than continuing to ramble on and on, I'm going to end this here. With a picture from a short (1 hr-ish) ride that I went on this evening.